Explores the extraordinary landscape paintings of central Australia by Aboriginal artists in the Gallery’s collection. Central to this exhibition are works by the founders of the Hermannsburg movement, Albert Namatjira and Otto Pareroultja. 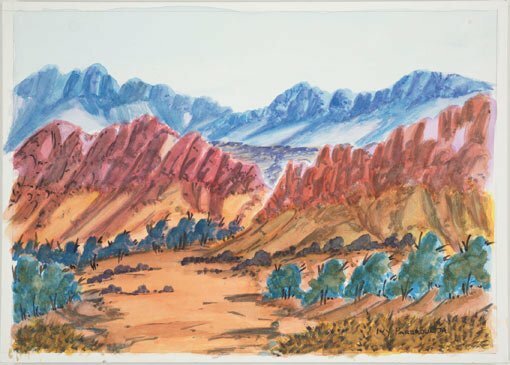 Their realistic representations of valleys, ranges and ubiquitous gum trees show an intimate connection to country that has informed numerous artists, including the late Billy Benn with his gestural paintings of the hills of his home lands and the more recent works of Ivy Pareroutlja with their highly keyed colour, stylised forms and distinctive line-work. Note: The closing date for this exhibition has changed to 2 June 2014. The Gallery apologises for any inconvenience.